Bhubaneswar: An exhibition of photographs, sketches and newspaper reports on the Great Orissa Famine of 1866 was inaugurated by Shri Ashok Panda, Minister for Culture at the hall of the State Archives today. The exhibition is being organised by The Indian National Trust for Art and Cultural Heritage (INTACH) and Odisha State Archives. On display are newspaper reports published in the overseas press of the 1866-68 periods along with sketches, cartoons, drawings and photographs. These shed new light of the conditions and the suffering of the people. Speaking on the occasion, Panda said that the Na’Anka Durbhikshya was a dark forgotten chapter of Odisha’s history. Even though the events that happened have been pushed to one corner of history, it has been a part of Odia consciousness and subconscious ever since. 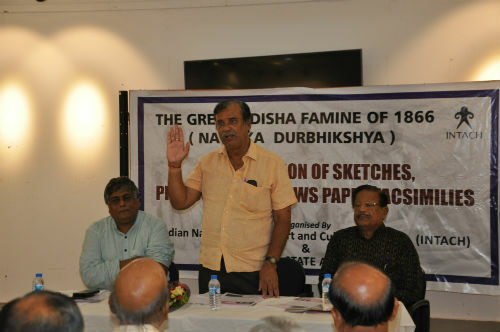 S.K.B.Narayan, Convener of INTACH said that even today, 150 years after the Great Famine, Odisha faces regular threats of calamities like droughts, floods and cyclones, and crop failures. He said that the exhibition would be taken to the other INTACH chapters of Bhadrak, Balasore & Baripada too. Anil Dhir, who has curated the exhibition, said that a suitable memorial of the Great Famine should be set up in memory of the million and a half who had perished. He said that the Famine was not an accident of nature. It was not providence; rather it was a series of mistakes. For many decades after the great famine, it was simply a dark and even humiliating experience which the survivors, and the survivors of the survivors, had little wish to recall, the anguish of a past in which men and women barely survived. Dhir said that we owe the dead as much respect and honour as we give to any brave action or any other defining moment of our history. The Great Famine was a cataclysm on a scale never witnessed in this nation before. And yet people endured, survived, emigrated and above all remembered. The Na’Anka should have been a wakeup call; several lessons should have been learnt. Every regime of Odisha has been discussing the eradication of poverty and backwardness since 1866. We are still one of the most poverty ridden states, with our marginalised small farmers bearing the brunt of misery. Crop failures still result in suicides, abd there is rampant malnutrition and at times starvation deaths too. Ramesh Mohapatro, Convener of the Pipili Sanskrutika Parishad said that a suitable memorial will be set up in Pipili in memory of the million who perished in the Famine. He said that even today, the scenario is not much different from the pre-famines years. The growth of population, deforestation, large dams, greenhouse effects, pollution, climate aberration, displacement, water scarcity etc. are some of the triggers that are keeping Odisha poor. Amiya Bhusan Tripathy, State Convener of INTACH is of the opinion that a correct history of the Famine and the post Famine years should be written . There was not a single narrative of the Great Orissa Famine available. For many years, the Famine was something to which we could not give a name; it was named as the Na’Anka. It was something with which we were not able to engage. It was something that generated a great silence. He said that valuable information can be collected from various sources in India and abroad. The newspaper reports of the period, which are displayed in the exhibition, give a horrific account. The British Parliamentary Debates, the Famine Commission Report and contemporary writings of the time should be studied. The suffering of the victims has found place in the history and folklore of the State, being passed on from generation to generation. Shashanka Sekhar Das, the Limca Book of Record holder for the largest collection of newspapers in India was felicitated on the occasion. The exhibition will remain open from 10 a.m. to 5 p.m. till the 6th April.